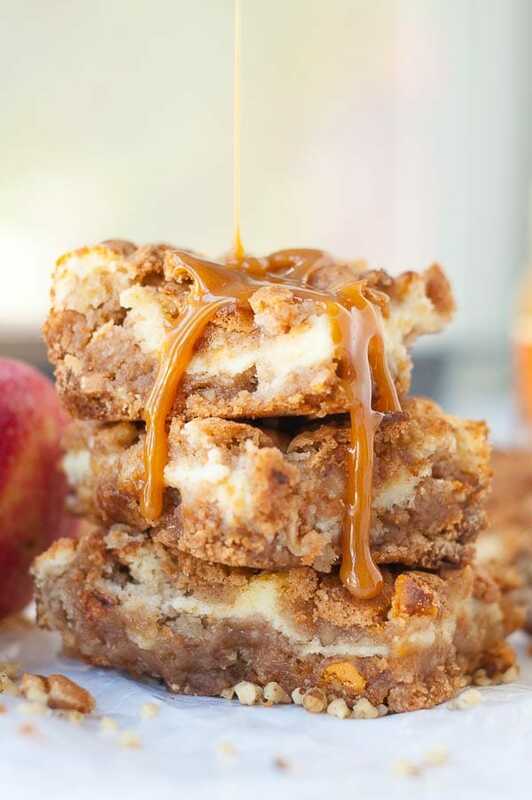 Snickerdoodle Bars are a home-run hit recipe guaranteed to be devoured! 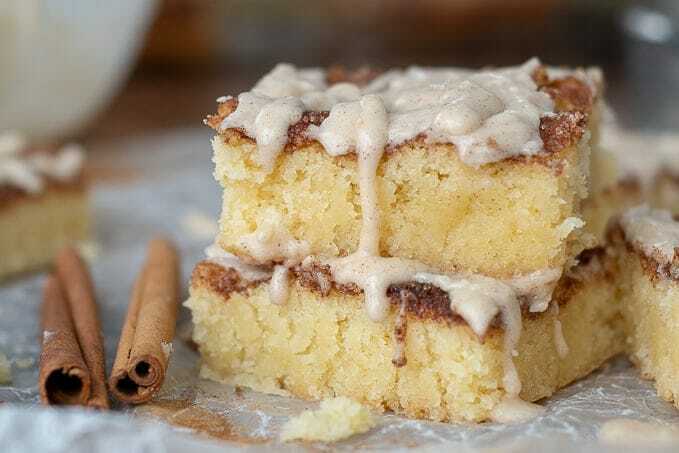 Thick, soft, and chewy snickerdoodle bars are covered in an ooey, gooey cinnamon sugar vanilla glaze frosting. Snickerdoodle Bars fall under the jurisdiction of minimal effort equalling big time pay out. If you ever need an easy, last minute dessert recipe to throw together in no time, you’re in luck. 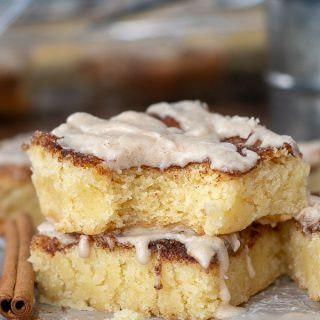 Snickerdoodle Bars are dump and bake perfection! These bars are extremely easy to throw together because all the ingredients are mixed in one bowl. 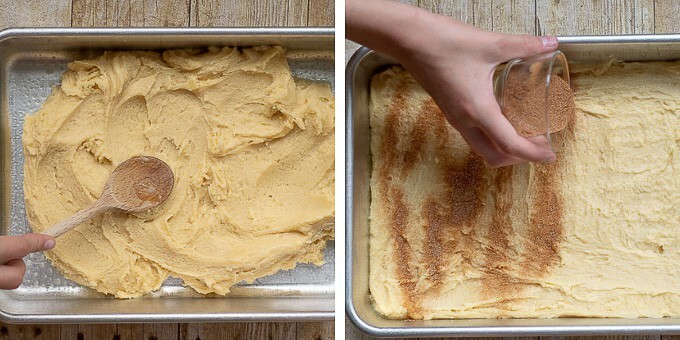 Unlike snickerdoodle cookies, there is no need to chill or roll dough. 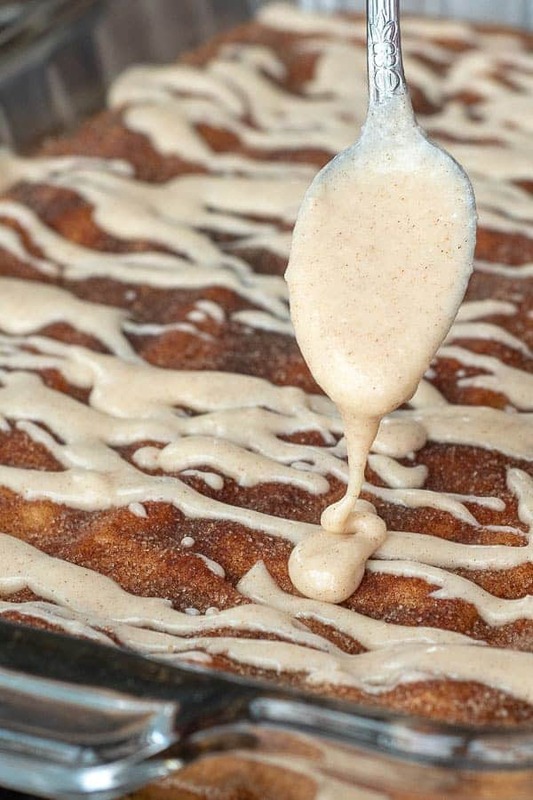 Just dump the batter in a 9X13 pan and sprinkle cinnamon and sugar on top. A very simple and quick frosting is drizzled over top to make these brownies over-the-top perfection. 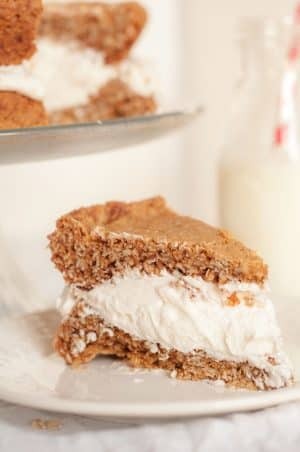 I bet you have everything you need to make these Easy Snickerdoodle Bars right now! Another reason I turn to this recipe time and again is because I always have all the ingredients on hand! But I don’t have cream of tartar, is there a substitute? Cream of tartar gives snickerdoodle cookies and bars that wonderful soft, doughy texture. It’s actually a leavener that reacts with baking powder or baking soda. If you don’t have cream of tartar on hand substitute 2 teaspoons of lemon juice or vinegar for every 1 teaspoon of cream of tartar called for. 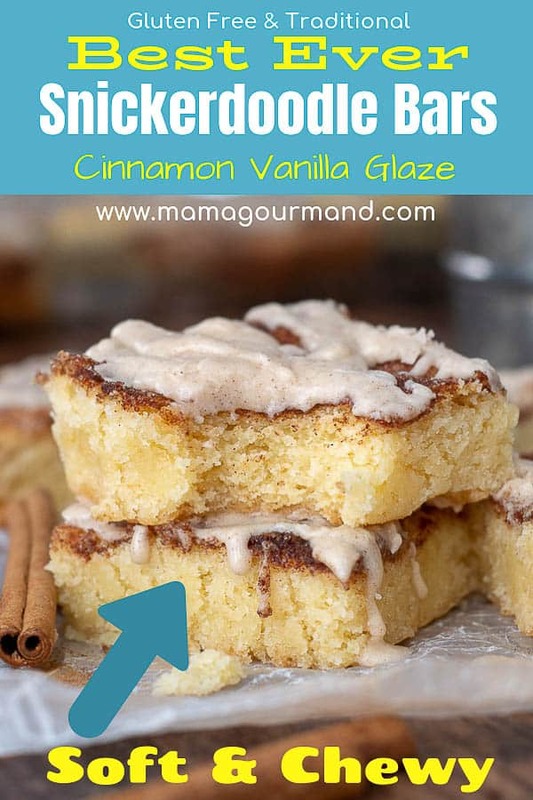 In this Snickerdoodle Bars recipe, substitute 1 teaspoon of lemon juice or vinegar for the 1/2 teaspoon cream of tartar. 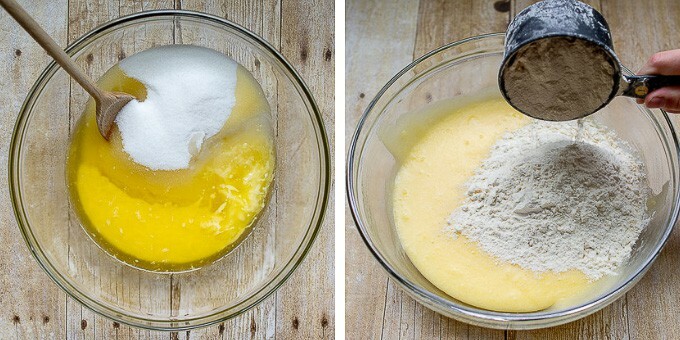 Stir together melted butter, sugar, milk, and eggs in a large bowl. Add flour, baking powder, cream of tartar, and salt. Stir to combine. Press down into a 9X13 pan and sprinkle cinnamon and sugar on top. Bake for 30 minutes and cool slightly. Mix together frosting ingredients and drizzle on top. 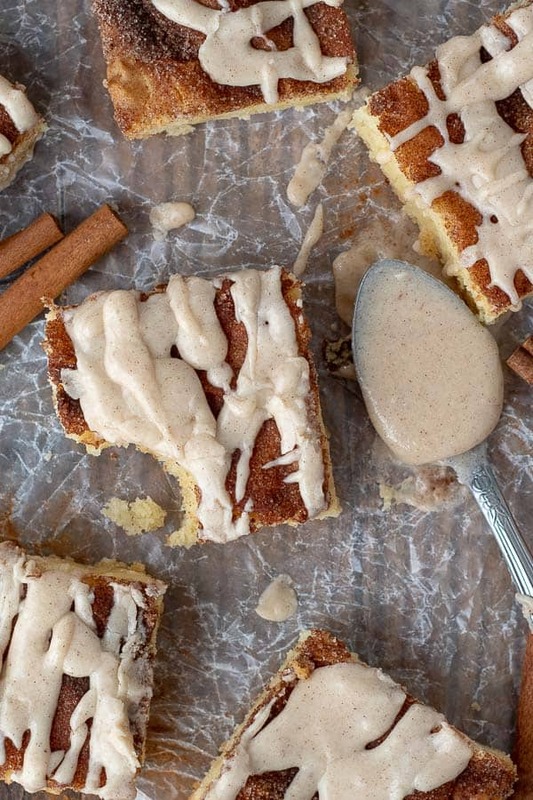 SAVE THESE SNICKERDOODLE BARS TO YOUR PINTEREST BOARD! 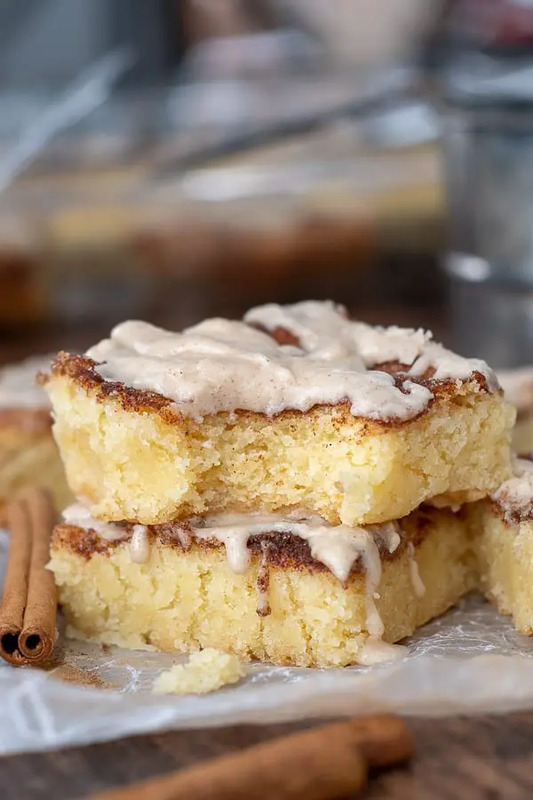 Thick, soft, and chewy Snickerdoodle Bars are covered in a ooey, gooey cinnamon sugar vanilla glaze. An easy snickerdoodles recipe guaranteed to be a hit! Preheat oven to 350ºF and grease a 9X13" pan. In a large bowl combine melted butter, sugar, and milk. Add eggs and mix thoroughly. Add all-purpose flour or gluten free flour, baking powder, cream of tartar, and salt to bowl and stir until combined. Press down into prepared pan and sprinkle all over with combined sugar and cinnamon topping mixture. Bake for 30-33 minutes (5 minutes longer if using gluten free flour) or toothpick inserted in middle comes out clean. Cool for about 30 minutes before drizzling topping on. Combine all the topping ingredients, except milk, in a bowl. Slowly add milk until you reach the desired pourable consistency. Drizzle all over slightly cooled bars. First of all, I admire your persistence! I want to help you get this figured out, but I have a couple more questions…Are you making with regular flour or gluten free (the brand of gf flour could affect them). Also, it could be the baking powder that’s causing it not to rise correctly. And you are melting the butter? this repice sounds really good.it does noty show how much ingredients go in it. the meauredments. Hi Monica, I show the measurements on my end. I will email you a screenshot to make sure you have it. I made these last week, and they were AMAZING! Way easier than individual snickerdoodle cookies with the same delicious taste. The glaze is an added bonus! Thanks for the perfect twist on an old standby! I completely agree. I often make brownies / bars rather than cookies because you just dump it in a pan and bake. These are great because you don’t have to roll individual balls and roll them in cinnamon and sugar too. Glad you enjoyed them! I’m wondering if you can make these as round drop cookies and if the glaze gardens? My daughter is getting married and they would like to make snickerdoodles as favors w a tag about SMICKerdoodles.. Because her last name will be Smick. Hi Alison, What a cute idea! I love it. I think your best bet would be to use a snickerdoodle cookie recipe. 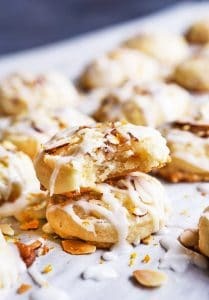 For cookies you would use softened butter, not melted, and you would chill the dough before rolling them into balls to coat in cinnamon sugar. Then you can use my glaze recipe over the top. The glaze would work out great because it hardens as it dries so it wouldn’t be a mess for favors. You can make all cookie “balls” ahead of time, freeze them, and then bake them from frozen when it’s getting close to wedding time. Amazing!!!! My crew absolutely loved them. We served them with vanilla ice cream to make it a full on dessert. Great idea, Sarah! So glad you guys enjoyed them. Thanks for stopping by Thalia! Wait till you try them…as good as they look and so easy to make!